Saints have secured the long-term future of another key member of their squad. Jonny Lomax has signed a new four-year contract to keep him at the Totally Wicked Stadium until the end of the 2022 season. Jonny has been with the club for more than 10 years after progressing from the Saints academy set-up, making his first team debut in 2009 and going on to secure a testimonial this year. The stand-off said: “Obviously, I am made up to have re-signed for the team I have supported and followed from a young age in the stands. ''Growing up, it was a dream to play for the club and I have been able to live that dream for the last 10 years, culminating in a testimonial, and will now be able to continue it for a further three years. ''My career has had its up and downs, but hopefully we can now add to the good times in the pursuit of trophies this year and beyond as we look to build on 2018. ''It’s great committing to the club following Robes and Tommy last week. It is a sign of how close the group is in pursuit of a common goal – trophies. Hopefully there are more to follow suit." Saints' chairman Eamonn McManus said: “It’s great news, indeed, that Jonny has extended his current deal to 2022. 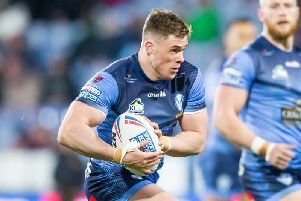 ''He has been with the club man and boy and is an outstanding rugby league talent. Coming hard on the heels of new deals for skipper James Roby and Golden Boot winner Tommy Makinson, it further illustrates the club’s strategic priority to retain international class talent which has been produced by the club academy set up. Head coach Justin Holbrook said: “It’s more fantastic news for our club. Jonny is coming into his best years as a rugby league player.